SmartWater is an asset protection system in the form of a clear liquid which contains a unique forensic code that is extremely robust and guaranteed to last a minimum of 5 years within all weather conditions. It is applied to items of value – personal, commercial, and industrial – which are frequently the target of theft. The non-hazardous patented liquid leaves a long-lasting identifying mark that is invisible except under ultraviolet black light. Law enforcement officials take the smallest micro-fragment of SmartWater from stolen property and send it to SmartWater’s forensic laboratories, where it is scientifically analyzed to identify the owner. More clicking brings me to the price list: $100 (well, $99 before tax) for a bottle of the stuff and a one-year license — apparently you have to keep paying the $100 every year to maintain your entry in their database, even though the coating is supposed to last for five years. Or you could pay $200 (per year!) for a what I suppose is a larger bottle that does your car, or at least key parts of it that don’t have a VIN. Oh yes, you also get stickers to show off you think you have lots of valuable stuff worth stealing deter really up-to-date thieves. Nowhere on the Smartwatercsi site (that I got sent to by the sign on public land) does it reveal a secret disclosed in this video that I found by doing some Googling: apparently by calling 305-441-5760 Coral Gables residents can get a “smartwater kit” for $30 (no mention of the annual fee after that, though). I called that number and got a recording telling me I’d reached the Coral Gables Citizens Crimewatch, they were unable to answer the phone but they are there to serve and assist me in any way, so I should my name and number and they’d get back to me. More Googling revealed a Coral Gables police press release dated Feb. 12, 2014 that says you should call 305-476-7957 for the $30 offer. (It may have come out in February but this is the first I ever heard of it.) That number took me to what proclaims itself as the Coral Gables Police Department Smwartwater hotline. I’m going to rate the hotline water temperature at only lukewarm, given that this too was a recording that wanted my name and number and would get back to me. How many people in Coral Gables have actually signed up for this? Is the $30 Coral Gables price a one-time fee, or will there be annual charges too? Is there enough to cover your car? Or at least those headlamps that get stolen so often? Do you get all the stuff in the $100 pack or just a bottle and applicator? If there are ongoing annual charges, does the City have any guarantees about future price increases? Is there a danger Smartwatercsi will raise the price of the required annual user fee (if there is one) once they have a big installed base? Does the fact that a sign appeared nearby mean someone around here actually bought the stuff? If so, did they pay the $30 or the $100? Has anyone ever paid $100/year for this? Why don’t the signs–on public land, presumably set up with the City’s permission–direct you to a web page which discloses the Coral Gables discount? 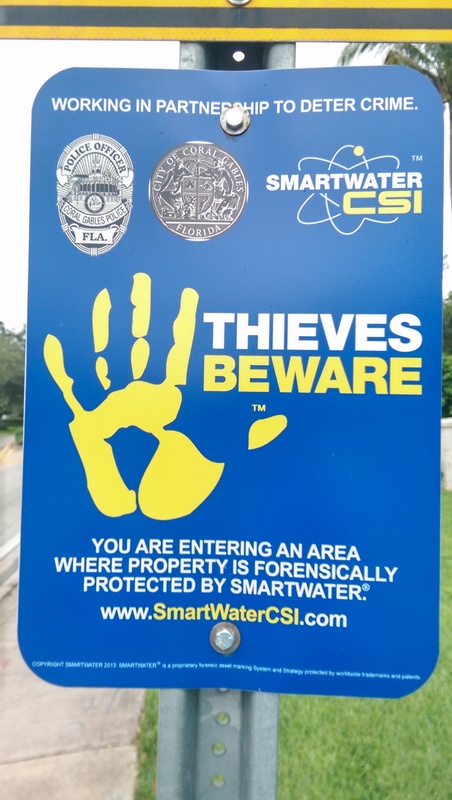 If someone from Coral Gables goes to the Smartwatercsi site not knowing about the discount and tries to make a purchase, will Smartwatercsi tell them about it? Does the Smartwater beverage company know about this? Actually, I’m kidding about the last one – a drink and a crime deterrent are sufficiently dissimilar to make a likelihood of confusion as to the mark highly unlikely, and of course the website (but not the product) has “CSI” at the end of it. Wait, does the TV show know about this? The idea is for me to paint this stuff on my valuables as proof of ownership. I think a better idea would be for me to paint it on your valuables, and then call the police.